A quick + easy way to create a custom canopy look. 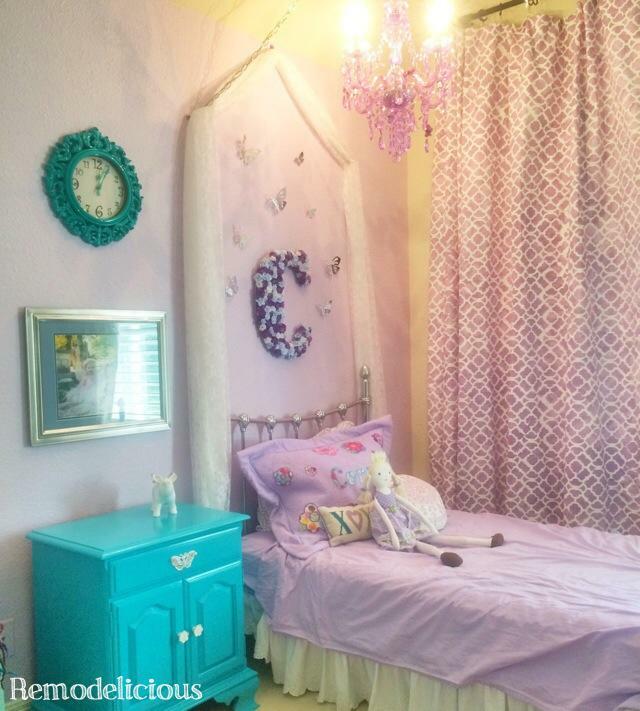 Miss Cora is in love with her new big girl room that is now in mid-(slow)-transformation. It’s purple & butterflies everywhere, but she wanted a little something extra: “princess fabric over her bed like Anna has”. As usual, we can blame Disney’s Frozen for this. The girls were given an adorable book about the sisters of Arendale, A Sister More Like Me (affiliate link). In this book, there’s a photo of Anna’s room with a beautiful cornice & fabric canopy. I’m not into mounting large, heavy objects over a curious two-year-old’s head in a room where she sleeps alone at night, but we were able to quickly get the same effect from fabric and command hooks. I had been wanting to do something like this to hide the chain and wire for the chandelier over Cora’s bed and she was happy to be a little more like Princess Anna. We picked up 6 yards of lacy fabric from the fabric store (don’t forget your coupons, they all have them!). 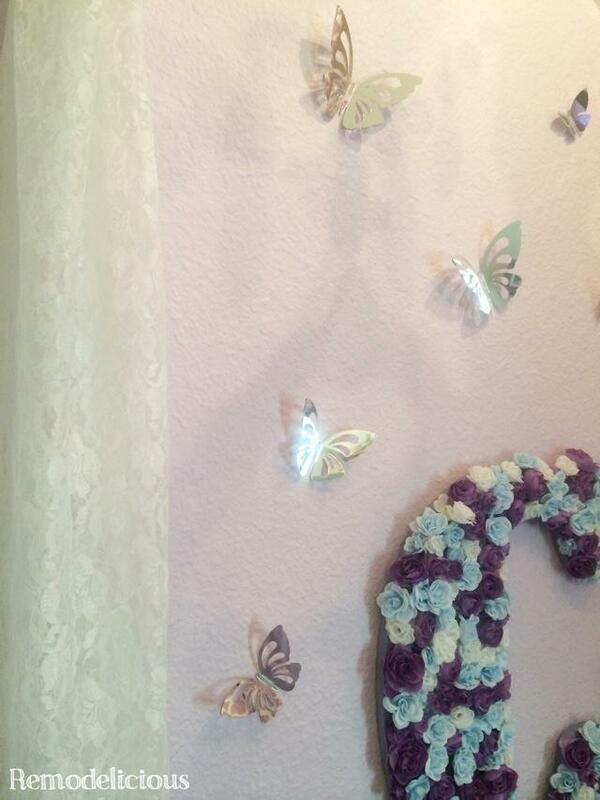 Most canopies like this use tulle, but I wanted something a little more custom and have been wanting to include lace for a girly touch in her room forever. We happened to have purple command hooks on hand (bonus), but the clear ones would also have been great. I centered one hook way up high over her bed and then used a hook above each post of the headboard, but a little lower. There’s really not any science to it, just go with what looks good (and won’t fall down). The holes in the lace fabric came in handy because I was able to punch through the lace for a tight hold. At the top, I used some matching white string to tie around the lace and then tie to the hook for extra hold. 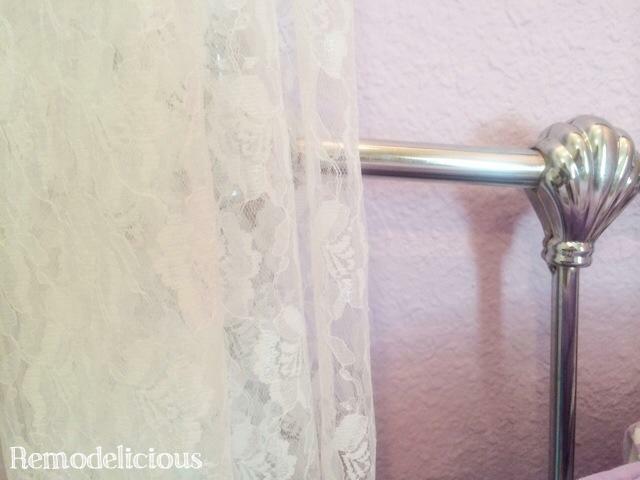 I love the white lace with the purple wall color and bright, chrome bed. It does make the bed wall seem a bit busy now, we we’ll be moving a couple things around, but after a long talk about how we don’t pull in the princess canopy and how we don’t touch the delicate butterflies, we’re good to go. Princess Anna Cora couldn’t be happier with the result. Proof that with kid rooms, elaborate projects are rarely necessary. You’ll have to excuse the zoomed-in photos for now. Princess Cora is keeping her took a bit like Princess Anna’s: DISASTROUS. I’ll be sharing new photos after we get a few more details up so stay tuned!